Why is Falling Asleep After Drinking Alcohol So Difficult? Most adults indulge in a tipple. After all, drinking is a social activity. Alcohol can sometimes help us to temporarily escape our worries, open up to people, and lower our inhibitions. Light-to-moderate drinking isn’t necessarily bad for you, either. In fact, one study in the Journal of the American College of Cardiology found that it may even help us live longer. Unfortunately, alcohol does have its downsides. As it’s a drug, it affects the body’s functions and processes in many ways. Everyone’s familiar with the slurring of words, stumbling, and sickness that can occur after consuming too much to drink. However, one of the most bothersome side effects of alcohol is its interaction with sleep. Alcohol tends to make it difficult to fall asleep, even if you feel incredibly tired. When you do sleep, you might find that it is interrupted or of a low quality. There are many reasons for this, some of which may surprise you. Today, we’ll look into why it’s so difficult to fall asleep after drinking alcohol. We’ll also explore some useful tips for getting a good night’s sleep when drunk or a little the worse for wear! Experiencing insomnia after drinking binge is not a pleasant feeling. If drinking in the evening is a hobby of yours, you’ll be all too familiar with alcohol’s effects on sleep. Although some people find that one small drink helps them sleep better, it’s a delicate balance. Drinking any more than that can make it harder to nod off. And when you are blessed with sleep, it’s often restless and intermittent. But how exactly does alcohol affect your sleep? What is it about the drug that stops us from getting a good night’s rest? One reason that you might experience insomnia after drinking alcohol is that it’s disrupted your circadian rhythm. “Circadian rhythm” is the scientific term for the body clock. It’s an internal sleep-wake cycle, which is usually 24 hours long. Your circadian rhythm gives you energy at specific points during the day. It also tells your body when to feel tired and fall asleep. If you usually find yourself getting tired at the same time every night, your circadian rhythm is responsible. The hypothalamus, an almond-sized part of the brain, controls the circadian rhythm. It reacts to specific stimuli such as light levels, and how long you’ve been awake. It uses this information to regulate energy and sleepiness. A study in the American Journal of Physiology found that alcohol can affect the hypothalamus, and therefore the circadian rhythm. 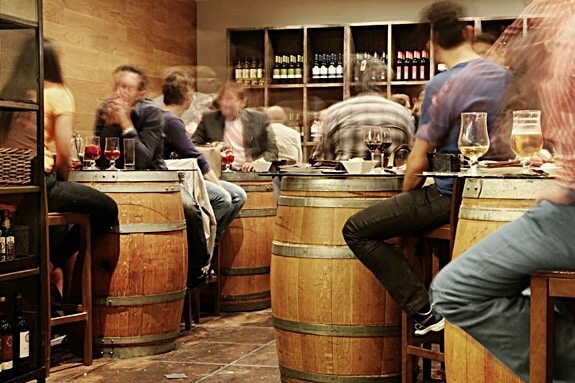 Alcohol inhibits the brain’s ability to respond to light cues correctly. So, even if it’s dark and you’ve been awake all day, your brain might not send out sleep hormones. You’ll end up feeling wide awake even when you should be feeling really tired. 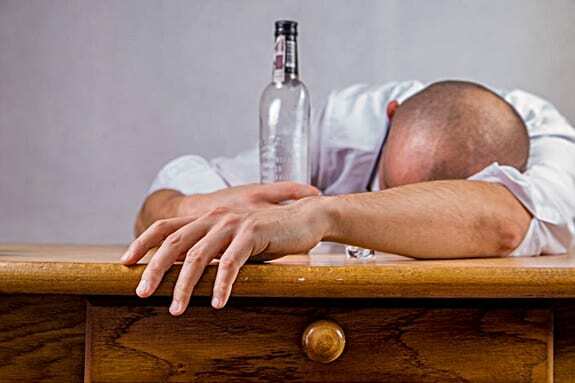 As well as the circadian rhythm, alcohol also disrupts the sleep cycle. So, even if you do get to sleep, you may not feel rested in the morning. During sleep, you usually cycle between 3 main stages. Light sleep is characterized by the body temperature and heart rate dropping. It’s easy to wake someone up from a light sleep. Deep sleep (slow-wave sleep). During deep sleep, the body restores and repairs itself. It’s difficult to wake up from a deep sleep. REM (rapid eye movement) sleep is when dreaming occurs, which is why the eyes move. During this stage, the brain is quite active. The body is paralyzed so that the sleeper doesn’t act out their dreams. Each sleep stage is essential for feeling well rested. They each serve different but equally important functions and contribute to normal cognitive functioning during the day. A study by the National Institute on Alcohol Abuse and Alcoholism found that alcohol changes time spent in each sleep stage. After drinking, you tend to fall into deep sleep quicker, missing out on light sleep. But, the deep sleep stage doesn’t last as long as it should. Throughout the night, you spend less time in light and deep sleep, and more time in REM sleep. This means that you may wake up feeling tired, groggy and unrested. You’re also likely to wake up earlier than you usually would. It’s much easier to wake up from REM sleep than deep sleep. If you’ve ever woken up unreasonably early after falling asleep drunk, this is why. After drinking alcohol, you probably find that you have to use the bathroom a lot during the night. Of course, this is partially due to all the water content of the alcohol that you’re drinking. That liquid has to go somewhere! But there’s also another reason for it. Alcohol is a diuretic, like caffeine. This means that it encourages our body to get rid of water. According to a paper in the Journal of Physiology, for every gram of alcohol consumed, urine production increases by 10ml. So the more you drink, the more you’ll have to go. And this doesn’t stop during the night. If you fall asleep drunk, you’ll probably wake up to use the bathroom a lot more than usual. This disrupts the sleep cycles, effectively resetting them every time you wake up. The diuretic effect of alcohol also causes sweating, which can be uncomfortable and cause you to wake up. And because of all this water loss, you’re also likely to wake up very thirsty. The result? Broken, interrupted sleep which doesn’t do much to refresh you. As if alcohol didn’t already do enough to damage sleep, it also causes trouble breathing. Alcohol is a depressant, which means it slows down communication between the nerves and brain. The result is that we feel much more relaxed. It’s not just our minds that relax, though. Alcohol also relaxes the muscles in the body. This is one reason why it’s harder to walk when you’ve had a lot to drink. This relaxing consequence of alcohol doesn’t just affect the muscles in the legs, though. It also relaxes the muscles in the mouth, throat, and nose. When these muscles relax, air can struggle to flow freely in and out. The result is vibration, more commonly called snoring. If you’ve ever noticed that you or your partner snores more after drinking, this is why. While snoring sounds comical, it can be an indicator that you’re not getting enough air while you sleep. This can result in waking up multiple times a night. You might also wake up because your snoring is so loud that it startles you. All of these reasons, added together, can contribute to an abysmal night’s sleep. So if you find that you can’t sleep after drinking wine, spirits or beer, now you know why. Now that you know precisely why your sleep is so terrible after drinking, what can you do about it? Fortunately, there are some steps you can take to help improve your sleep under the influence of alcohol. If you follow our top tips, you’ll be as prepared as possible for a good night’s sleep after a night out. You may have heard the old advice to never drink on an empty stomach. It turns out that this isn’t just an old wives’ tale. Drinking on an empty stomach can affect how the body absorbs and process alcohol. By extension, it also affects how well you’ll sleep after a night of drinking. First off, if there’s food in the stomach, you won’t get drunk as quickly. This is because the presence of food in the stomach slows the absorption of alcohol into the bloodstream. If you drink on an empty stomach, you’re likely to feel the effects of alcohol a lot more quickly. Eating a nutritious, balanced meal before you go out will help slow you down. Food also reduces the concentration of alcohol in the blood. A paper in the Journal of Studies on Alcohol found that eating a meal can lower blood alcohol concentration by 30%. So not only will it take longer to get drunk, but you’ll end up less drunk overall. And being less drunk equals a better night’s sleep. Finally, eating a meal before starting to drink can help you sober up quicker. The presence of food helps to rid alcohol from the bloodstream sooner. This means that alcohol will affect your quality of sleep less than it usually wood. To sleep better when drunk, you need to make sure your bedroom is prepared well in advance. That means taking the time to set up your sleeping quarters before you head out for the evening. When you get back home, you’ll have already set up an ideal place to lay your head. This will make it easier to fall asleep, and stay asleep. When you’re drunk, you sleep less deeply. The slightest thing might wake you up. That’s why it’s important to make sure your room is dark so that the morning light won’t disturb you. If you have blackout blinds or curtains, close them. If not, invest in a good quality sleep mask and leave it on your nightstand. It’s much easier to fall and stay asleep in a cool environment. Make sure your room is between 60 to 68 degrees Fahrenheit for the best result. This will keep you from waking up due to being too hot. Before you leave, turn off all electronics and appliances that might make noise. You don’t want to leave your dishwasher going overnight. Switch your cell phone to silent, and close all windows. To be on the safe side, purchase some earplugs to use as well. Make sure your bed is comfortable enough to help you drift off easily. Ensure there are no objects in your bed that might cause discomfort. Change the sheets, and make sure the bed is made before you go out. As we’ve said before, alcohol is a diuretic. This means that it encourages water loss, effectively dehydrating you. This is why you have to visit the bathroom more often when you’ve been drinking. Dehydration is one of the big reasons why drinking alcohol makes it difficult to sleep. It can give you a bad headache, dry mouth, and make you feel dizzy. If you’re this uncomfortable, it’ll be hard to switch off. If you aren’t adequately hydrated, you’ll wake up more in the night – either due to thirst or pain. You may think that you’ve drunk a lot of liquid, especially if you’re drinking beer or cider. But much of this is going to be lost through urine and sweat. It’s important to keep drinking water throughout the evening to replace this. If possible, drink a glass of water after each alcoholic drink. As well as keeping you hydrated, it’ll also keep your stomach full. This means that you’ll end up drinking fewer alcoholic beverages. Drinking less alcohol means your body will be able to get rid of it quicker. This will all add up to a better sleep. Knowing when to stop drinking is the key to getting a good sleep. After all, the drunker you are, the harder it will be to sleep. It’s also more difficult to sleep if you drink too close to bedtime. Ideally, you should aim to drink just enough alcohol to feel slightly drunk. 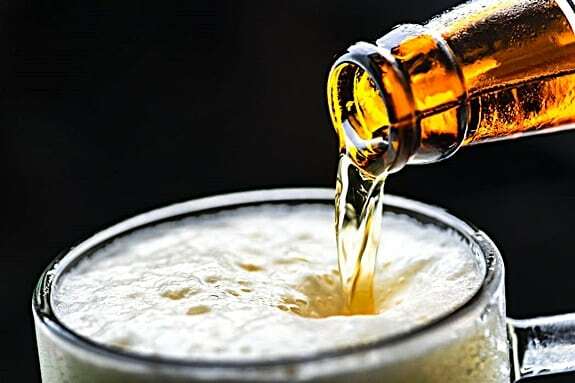 You only need to consume one or two units of alcohol to feel the pleasant buzz of being “tipsy.” This is roughly the same amount in one beer or a shot of spirits. You’ll still get the benefit of feeling happier and more sociable, without making yourself unwell. If you do want to drink more than that, you should stop drinking long before bedtime. It takes your liver approximately one hour to process one unit of alcohol. If possible, plan it so that your body will be able to process the alcohol before you go to sleep. For example, an average sized glass of wine contains about two units, depending on strength. If you’re going to drink three glasses of wine, plan to finish your last one 6 hours before getting into bed. It’s not always possible to stop drinking this early, though. If you can’t, slow down. As the night goes on, drink a couple of glasses of water in between alcoholic beverages. Order larger, weaker drinks which will take you longer to finish. For example, instead of a double whiskey ordered neat, order a small whiskey diluted with 8 ounces of soda. So you’ve made it home after your night out. You might feel exhausted, but don’t just hit the hay immediately. There are a few things you can do before going to bed that will help you sleep more easily. Avoid screens. When you get home, don’t be tempted to watch TV or use your mobile phone. Screens emit blue light which replicates the brightness of day. Using screens before bed makes it harder to fall asleep. Limit medication. You may have a headache, but try not to go too crazy with pills. Acetaminophen-based painkillers such as Tylenol should never be mixed with alcohol as it can harm your liver. If you must, take an ibuprofen before bed, but that’s it. Don’t take sleeping pills, as they can be dangerous when interacting with alcohol. Take vitamins. Drinking a lot of alcohol can deplete nutrients from your body. Keep a bottle of multivitamins near the bed and take one before you sleep. Eat a healthy snack. It’s common to get quite hungry after you’ve had a lot to drink. However, don’t indulge in very fatty or dense foods before bed. This can cause indigestion and an uncomfortable night’s sleep. Instead, opt for fruit, veggies or toast. One final glass of water. Staying hydrated is important, but don’t be tempted to down 32 ounces before bed. You’ll wake up more often to use the bathroom. Have one small glass of water, and keep one on your bedside in case you get thirsty in the night. So, you’ve woken up in the middle of the night because you’ve drunk too much. Perhaps it’s because you were thirsty, or needed the bathroom. Maybe your own snoring woke you up. Or, you’re just wide awake for no reason, as the alcohol has torn you out of deep sleep. How do you drift off again? Here are our top tips. Stay in the dark. If you encounter any light when you wake up, your body clock will think it’s time to get up. These means that you shouldn’t be checking your phone. If you need to go to the bathroom, don’t turn on the light. Have a glass of water. You may have woken up early because you’re dehydrated. Drink some water and see if it’ll help you fall back to sleep. Try to clear your mind of any thought. There is some logic to the adage of “counting sheep,” after all. Stay quiet, lying down with your eyes closed, and focus on breathing deeply. Listen to slow, soothing music. If meditation doesn’t work, try listening to some calming music as you try to fall asleep. Music with a very slow beat can help lower your heart rate, making it easier to fall asleep. Read a book. Sometimes, reading a book can help you drift off to sleep. Choose the most boring book that you own. Don’t read on a tablet computer or e-reader with a backlight. Instead, choose a good-old fashioned paperback, and read under dim light. Follow these tips, and you should nod back off to sleep before long. Hopefully, you don’t have work in the morning, though, as you’ll need a bit more sleep than usual. If you’ve followed all of our advice, you should notice that you sleep better the next time you drink. In any case, the effects that alcohol has on sleep shouldn’t last for very long. You’ll usually have only one night of substandard sleep, and in the morning you might not feel too perky. Most of the time, any alcohol left in your system will wear off during the day after your binge. You can’t do much to hasten this process. The only real cure for a hangover is time. Though, eating a hearty breakfast or drinking some coffee may ease the symptoms a little. On rare occasions, though, you might find that alcohol is still affecting you for days after you stop drinking. This is usually to do with the amount of alcohol that you drank. You may have consumed so much alcohol that your liver is taking a lot longer to process it than usual. Remember to stay hydrated, and eat properly as well. Not drinking enough water or eating enough can lengthen a hangover. Age may also have something to do with it. The older you get, the longer hangovers will last. If you’ve noticed alcohol starting to affect you for longer, it may be down to your age. If you’ve got any concern about your health after drinking alcohol, see a medical professional. The symptoms of binge drinking should not last longer than a few days. If they do, you might have another problem going on that you don’t know about. What Are the Causes of Adults Falling Out of Bed? Should You Go for a Walk before Bed?